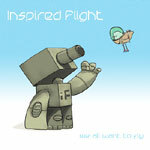 Indie rock-electronica from OpenOptics on turntables and various instrumentation with lead vocalist/instrumentalist Chavez as they form to create Inspired Flight. And the album truly is inspiring and beautifully produced. Keeping the tempo down, mid, and sometimes up, every track featuring a guest does well to balance out the mood, with hip hop friendly vibes for the emcees, and additional live instrument contributions from various others. We All Want To Fly is dreamy and thought provoking, and one of the better alternative listens of the year. Featuring Eligh, Scarub, Rugged Monk of Black Knights, and Inspectah Deck. Its an album no matter what style of hip hop you like you will never regret buying. These guys are extremely talented, there not just on a beat machine like most producers. They do live instrumentation and turn tablism similar to that of Kid Koala. Definitely gotta copp it, some of the freshest Indy hip hop music coming out of San Diego.